What causes fluctuating employee role engagement? A rapidly growing area of research and interest in business is the area of corporate social responsibility or CSR. 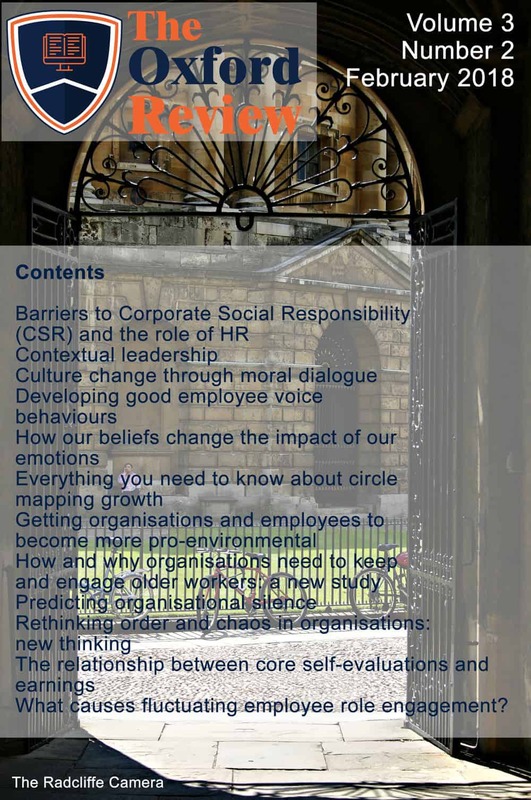 While, hitherto, much of the research has been focused on macro level CSR issues, such as how organisations engage with their corporate social responsibility, for example, there has been a recent shift towards research that looks at individual level characteristics and behaviours and how they impact corporate social responsibility thinking and actions. This study shows that there are 15 predictors that and organisation will engage properly with CSR, how to get a good level of CSR engagement and how HR can assist with this. Contextual leadership is a growing research trend and aims to look at whether and how situational or contextual factors impact leadership performance practices, and how leadership actually takes place in different contexts. Up until now much of the research is focused on types of leadership, such as transformational leadership or servant leadership, for example, and has tended to do so without much reference to the context within which the leadership is taking place. Understanding how any particular context influences leadership and its outcomes is critical in understanding how different leadership styles perform and achieve their outcomes. This study shows exactly what the contextual aspects of leadership are, broken down into useful elements, and how leadership needs to differ in the different types of context. The briefing is not only essential for leaders but anyone involved in leadership development. Sociologists and ethnographers have known for years that moral dialogues can be a powerful mechanism for cultural change. Good examples of this are the recent public dialogues about sexual harassment in public office and gun-control in the United States. It is interesting to see how schoolchildren have taken control of the moral dialogue in the United States and are attempting to create change with it around the public availability of firearms. This briefing shows both the stages moral dialogues need to go through to create change and how to create a moral dialogue in order to create culture change. An excellent research briefing for anyone trying to create or manage change in almost any context. In recent years there has been a significant increase in research around employee voice behaviours. This interest stems from wanting to know why some employees decide to speak up and voice their opinions when they see things going wrong in organisations and why others remain silent. Developing healthy employee voice behaviours is seen as a critical aspect of organisational development and leadership, as it is important to find out what employees are really thinking and feeling about what is going on inside the organisation. In particular this research shows which leadership behaviours help to develop constructive voice behaviours. This is useful for leaders, leadership development professionals and those engaged in organisational development. This research briefing is based on a series of primary research experiements which shows just how our beliefs cange the impact of our emotions. This is useful for everyone and is certainly a study learning and development / coaches should be aware of. These then need to be combined and formed into a systematic growth strategy. Previous research has found that leaders frequently find this to be a daunting task, largely because of the sheer amount of data such analysis creates. It is often difficult to see through the data to analyse a reasonable growth strategy. This overwhelm of data often means that growth strategies are based on opinion and gut feeling. This research briefing shows a new way to develop growth plans using a graphical approach called circle mapping. A most useful tool for anyone with a business and in organisational development. Outside of the various nations’ environmental legislation, getting organisations to become more environmentally friendly is largely dependent on the initiative of employees within the organisation. It is usually down to individual employees to engage in a range of environmental behaviours, such as recycling, using carpools, videoconferencing, etc. A number of previous studies found that many internal ‘green’ policies and systems tend to be largely symbolic and result in little actual change. Behaviours such as leaving lights and electrical appliances on for extended periods, travelling instead of videoconferencing, using private as opposed to public transportation, using disposable plastic and paper cups and bottles as opposed to either recyclable ones or reusable utensils are still rife in our organisations. The predominant mentality appears to be “we can’t afford it”. A new systematic review of previous studies looking at the barriers to pro-environmental behaviours has just been published by a team of researchers. The systematic review started with over 8000 studies to try to find mutually agreed findings about the barriers to pro-environmental behaviours in organisations and how to tackle these. It is estimated that, over the next 20 years, there will be a significant shortage of experienced and trained workers in many sectors within the economy. The World Economic Forum has projected that significant talent gaps will appear in many areas and countries in the next 10 to 20 years. It is forecast that this shortage of skilled labour between 2020 and 2030 will have a significant negative impact on the global economy. Additionally, the end of the baby boomer demographic bubble over the next 5 to 10 years will mean that an increased proportion of the population will be in retirement, with a smaller percentage of the population supporting them. As a result, many analysts predict that organisations and businesses are going to need to retain workers beyond the traditional retirement age of 65. It is also forecast that countries that rely on migrant workers will also be in trouble, because there will be a significant skills gap with the types of work that these workers can perform in an economy that will be increasingly technical and AI driven. A new study by researchers in America have been looking at this issue and trying to find out how organisations can prepare themselves to take advantage of this demographic shift. The issue of organisational silence is a serious one for many organisations. Organisational silence refers to an often cultural phenomenon whereby people say and do little when they notice significant problems within an organisation. Organisational silence is seen as a significant barrier to good organisational change and performance. It is particularly likely to occur where employees perceive that there is a climate or culture of silence or in response to events and behaviours that they perceive to be problematic or wrong. Part of the issue with organisational silence is that it is often hidden under layers of management and finding the antecedents and causes of the silence is often not easy. It has been found to be a major contributor to low levels of organisational growth performance. This briefing looks at a study that examines leadership involvement in organisational silence. Virtually every other paper published these days mentions the fact that organisations and their environments are becoming more and more complex and facing greater levels of uncertainty, whilst, at the same time, there is a constant pressure for greater levels of operational efficiency and innovation with reduced resources. One of the consequences of these pressures has been what recent research has termed as the “projectification” of organisations and society. ,This means that work is now being carried out in a series of (often multi-team) ‘projects’ rather than a linear mass production line system or method of organisation, where items or processes are handed on to the next ‘experts’ in the system. This move into a more project oriented mode of production means that organisations are faced with constantly shifting workforce groups, teams and even leaders. As a consequence, the organisational structures have to reflect the temporary and constantly shifting nature of these projects and their teams by continually being shaped and reshaped on an ongoing basis. As a result, a number of studies have found that organisations are moving towards a place of almost continual restructuring. A new study by a team of researchers has looked at this issue and developed a conceptual framework for dealing with it. in an effort to discover how organisations can best orient themselves towards this issue of projectification. This study is very useful for anyone involved in project management. Organisations and functions like human resources, leadership and management are becoming increasingly interested in the role personality plays in organisational performance. This is evidenced by the huge increase in the use of psychometrics in organisations to make work performance predictions. Core self-evaluation has been found in previous studies to predict a range of employee work behaviours, including job satisfaction, performance and entrepreneurial orientation, as well as being connected to the achievement of a range of organisational performance factors. The researchers wanted to know whether core self-evaluation predicts earnings in “nationally representative data sets” and whether this relationship is linear or not. When people talk about employee engagement, it tends to be used as an absolute or a measure of absolute general engagement. Few studies hitherto have looked at whether engagement fluctuates and changes from day to day or even within a single day. Employee engagement has become one of the hot topics in research, for practitioners and organisations, and is particularly germane for organisational development and human resources practitioners. Employee role engagement is a subset of the broader concept of employee engagement and is the focus of the study in this briefing.